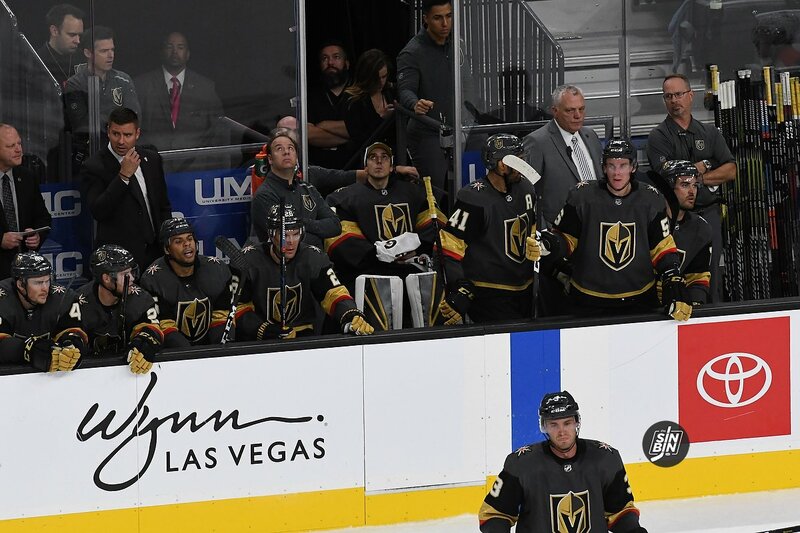 When I first started following the Knights story before they took to the ice it was amazing to see some many people get pumped about having a team to call their own. But what came with it is other fan bases saying that ‘we are on a bandwagon’ and will soon jump off it. I’d hate to see these people be proved right because of THREE games in our second season. I believe that the panic button should not be hit, now, or anytime in the next couple of years, unless of course, they do go complete balls up and the team regresses to a point that they are unrecognizable. I do understand that we are entitled to criticize how poorly someone has played or whether the forecheck was absolutely shocking, I do it – we all do it. But don’t go down the route of leaving your seats early and refusing to watch the team and even revoking support (believe it or not I saw a tweet stating this). Over on this side of the Atlantic we call those people ‘glory hunters’, where the hunter will conveniently change support to choose a winning team. It’s not a great look. Let’s not forget the quality is there on the ice, it’s a Stanley Cup Final team! New lines, players and systems take time to bed in. The coaches are the same, we have got the same great GMGM and some brilliant prospects waiting in the wings with great promise. Not forgetting, that we have got the best in-rink crowd in the NHL by a desert mile. It’s all a process and you must trust that it will happen. Of course, winning is hugely important but remember this team brought our community together when we needed it most, now the team needs us, so get chanting, bring the noise and ‘keep calm and carry on’, win or lose. Welcome to the NHL. 1.) I think the overblown reaction to this season’s performance thus far is just a reaction to how special last season’s really was. Watching my former favorite team growing up (Kings) was painful as I didn’t even get to see them win a Stanley Cup into my adulthood (and most of the time, they never even made it into the playoffs). IT WAS ABSOLUTELY AMAZING TO SEE A FIRST YEAR TEAM EVEN MAKE IT INTO THE PLAYOFFS. Win or lose in Round One, I was damn proud of the Knights to even make it that far. 2.) It also comes down to the fact that we have newer fans and they are drawing comparisons to other sports’ team performance. When looking at football for example, a 1-2 record has much more of an impact with only a 16 week schedule than an 82 game schedule. So far, this is merely a blip of the season. Let’s not forget, the Pacific Division favorites (at least) to win the Stanley Cup being the Sharks. They currently sit at a 2-2 record. Need to be patient up until the middle of November. November is too early. The all star break is usually the point when you evaluate a team and start to worry if things are not going well.